Synopsis: Chloe Saunders is fifteen and would love to be normal. Unfortunately, Chloe happens to be a genetically engineered necromancer who can raise the dead without even trying. She and her equally gifted (or should that be ‘cursed’?) friends are now running for their lives from the evil corporation that created them. *sigh* … I just love this series. 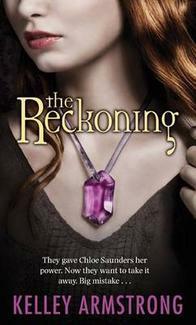 Though I find this one of the weaker books in this trilogy, I still absolutely adore Armtrong’s The Reckoning. A large part of me was considering giving this a 3 cups of tea rating … but I just couldn’t. There’s quite a bit of things I would change if I was the author, but there’s something about this series that just keeps me coming back. I truly believe it’s the character focused nature of this series, since I’m a HUGELY character oriented reader (which I’ve mentioned SO many times). So here’s to another review! CONTENT & TRIGGER WARNING: This book contains bullying (minimal), murder, hospitalization, loss of a loved one, previous loss of a parent, suicide (mentioned), pills (medical), and violence. Like its predecessors, The Reckoning continues to focus largely on character growth and development. The difference with The Reckoning in comparison to book one and two is that we have a little more insight into not just Chloe and Derek, but also Simon and Tori. Chloe remains as the central focus, but it was nice to have more focus on the other members of Chloe’s group through her POV; this is especially true for Tori, for I find she changes the MOST from book one to three out of all the characters. Reading all three books in a row has its benefits, for the development each character goes through is much more noticeable. There’s a lot more supernatural power use happening in The Reckoning … YAY! Chloe, Derek, Simon and Tori have finally begun to utilize their powers to their benefit. A large portion of this is through their training with other supernaturals, as they learn to control these grandiose abilities that so many fear. The end of the novel really explores this, as they fend for their lives in a final showdown with the enemy. Also seeing how Chloe makes her abilities useful in comparison to the others was a neat exploration story as well. Armstrong finally begins to dive more into the plot, discussing the purpose of the experiments and what’s to come. A HUGE part of the plot is discovering why these experiments happened to the children in the first place and how this supernatural group formed originally. Through the use of their own research and Chloe’s ability to speak to the dead, we finally learn WHY parents would ever allow these experiments and what drove them to choose this solution. But the BEST part for me during this read is learning why ALL these other supernaturals in the novel are so nervous and frightened of the children who were experimented on, like Chloe and her friends — now THAT really made things interesting. So no worries, readers … you’re questions will basically be explained. For once, there was a love triangle that didn’t COMPLETELY annoy me in a novel. As a LARGE portion of you know, I’m basically anti-love triangles — I find them pointless and a nuisance. But for SOME odd reason … no matter WHAT novel I read by Armstrong … the love triangles she presents don’t annoy the living daylights out of me. A big reason is she develops them with tact, slowly building them and carefully integrating it into the plot. The other reason is she doesn’t make the love triangle the central focus of the novel … it’s a subplot, that doesn’t overtake the story and doesn’t even really necessarily present itself like a traditional love triangle. It’s “unexpected” from the characters’ POV, rather than this centralized focus throughout the entirety of the series. The ending of this trilogy feels “unfinished”. This is ONE of those RARE times where I firmly believe an author should’ve extended a series rather then end it as a trilogy. There was SO many more parts of the main plot AND subplots that could’ve been explored (i.e. BIG story lines that aren’t addressed for some of the central characters), for this series only uncovered a small piece in the puzzle of these supernatural organizations. Even though we learn a lot more by the end of the novel, The Reckoning made me feel a little cheated and ripped off. Note: This MAY have been done deliberately as there’s a spin off series that continues this adventure but with different characters called Darkness Rising. In addition, there are a number of short stories regarding Chloe and her friends that are available online and discuss a BUNCH of the things that should’ve been discussed at the end of the third book. But I love THESE characters and just didn’t feel that completeness to say goodbye just yet. For being a supernatural adventure like novel, there wasn’t really that much “fight for your life” scenes as I would’ve liked. Okay … let me rephrase this — I WANTED MORE FIGHTING FOR THEIR LIVES BY USING THEIR ABILITIES SCENES!!! Other than the fact that the novel just “ends” (which, to be fair, DOES conclude everything with the spin off series … so don’t worry), this was probably by biggest issue with the novel. Thank GOSH readers get to have a look at Derek and Chloe’s abilities, but I wanted to look at Simon and Tori and the other supernatural beings in action more. Like the other books in this series, NON-CHARACTER ORIENTED READERS will probably not enjoy this as much. I’m not going to get into this TOO much, for I discussed this in my other reviews. But basically, this is not a story heavy, world developing story. It COULD be, but that’s not the point of it. This ENTIRE series is very character focused. Again … not a woe for me … but it may be for those looking for that world-building series. Armstrong’s The Reckoning is an enjoyable finale to the Darkest Powers trilogy. Though the novel leaves many unanswered questions and felt as though it ended too soon, the third book still provides a wealth of entertainment. In addition, the spin off series Darkness Rising is meant to conclude this adventure story by answering more about the supernatural groups experimenting on other supernaturals, in addition to exploring what happens to Chloe and her band of friends. If you’re looking for an easy and perfectly flowing read with some interesting supernatural characters, I suggest giving Armstrong’s Darkest Powers trilogy a go! Great this continued with character development and that there’s plenty of supernatural elements. I’m particularly impressed by the sound of this well executed love triangle though. Awesome review! I completely get that- I’m the same!